Thanks to our very good friends at Flip The Table (a wonderful podcast about terrible games), Pixel Lincoln: The Deckbuilding Game will be making a big appearance at SnowConMaine next month! Along side of such infamous classics as Heartthrob and Star Trek: The VHS Game, you can play Pixel Lincoln: The Deckbuilding Game before its release. Sign up early, because each session is limited to just 4 people. The Flip The Table guys will also have a handful of our unofficial Pause promo cards (which are running low!). But don’t worry, we have plans to make all of the promo cards readily available at some point in the future for those who couldn’t get to the events. Flip The Table Presents: Pixel Lincoln – Exclusive Pre-Release Demo! The weekend of January 18th is going to be a big one for Pixel Lincoln. With Pixel Lincoln 2 at Unpub along with our John Wilkes Tooth promo card, and now SnowConMaine, you’ll be able to get your Pixel Lincoln fix. Well, as long as you are in Delaware or Maine that weekend. You may know Chris, Jared, Flip and Professor Laserbooks from the podcast, but did you know that we go way back? All the way back to May of 2012, when the guys wrote and recorded a phenomenal audio advertisement to correspond with the launch of our Kickstarter campaign, and their podcast. Remember “You can’t handle the Booth”? That was all them. We also had a great meetup in Maine last summer, where we played Pixel Lincoln over burgers. If you could mash up 3 games that you’ve played, using theme, art, mechanics, components, etc.. to create the most terrible experience that you could imagine… which games would you choose? It’s a great podcast, part of the glorious Dice Tower Network, very unique and well produced, and very much recommended. Pixel Lincoln and Boss Monster?!?! I did a preview of Boss Monster over at Fruitless Pursuits called Boss Monster vs. Pixel Lincoln, and in a cool turn of events, you will be able to physically reenact your own Boss Monster / Pixel Lincoln battle in each game! 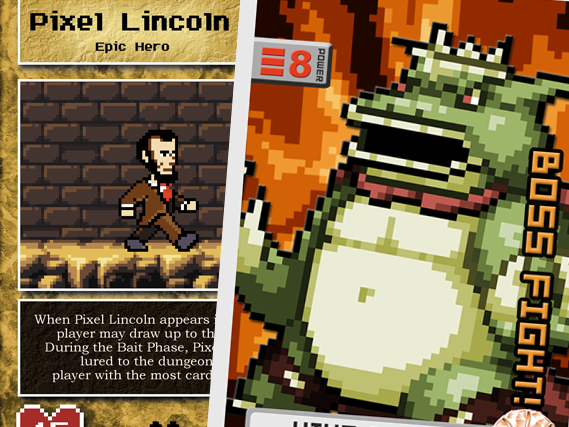 Boss Monster is including a Pixel Lincoln Epic Hero Card in its (insane!) $130,000 stretch goal. 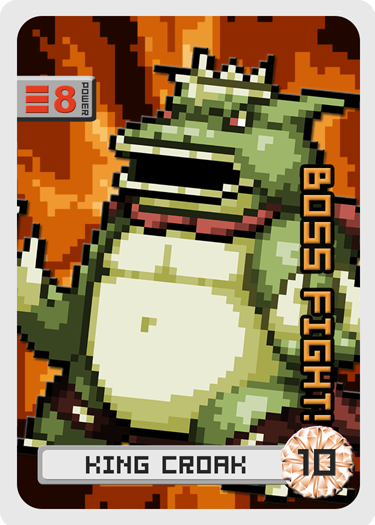 We’re making a King Croak boss card for an upcoming release or promotion (details to come). Check out my preview for a full recap of Boss Monster, and the gushy details of the similarities and differences between it and Pixel Lincoln. If you want the short version, it’s a LOT of fun and these are two awesome games that reference the best era of video games in very different ways. The differences will appeal to specific types of players, but the ones that enjoy both will soon be able to compare, contrast… and combine the two games. Super exciting! Not really, just make sure you vote today! Pixel Lincoln at BGG.CON with Rich Sommer and Game Salute! As you may know, Rich Sommer is part of our awesome celebrity pack. I was super excited about having Rich on board with his background in TV, film, and most importantly, the board game community. His blog (http://games.richsommer.com) has a wonderful take on solo games in the Solo Games Odyssey, and G4TV’s Game Night was the perfect board game/cable TV cross-over segment. You may also know that Rich is the special guest at BGG.Con on November 14-18 in DFW, Texas. 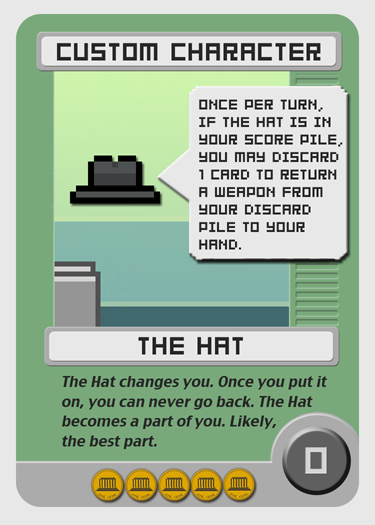 But… what you don’t know is that we teamed up with Rich to make a Pixel Lincoln “Evil Rich Sommer” Mini-Boss card, that you can only get directly from him at BGG.Con. It’s our first official promo release, and it turned out really cool. Keep an eye on Board Game Geek for Rich’s schedule at the convention. 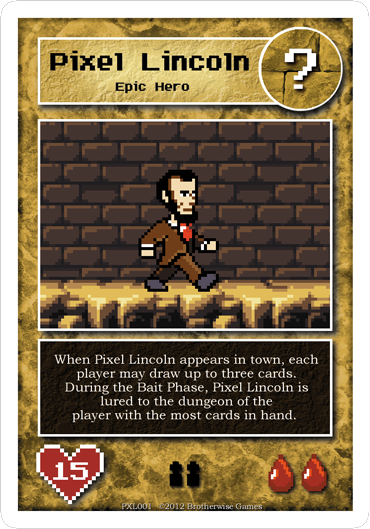 As for Game Salute, they will have copies of Pixel Lincoln: The Deckbuilding Game on hand for demos at BGG.Con. They have a huge booth, so you can’t miss them. 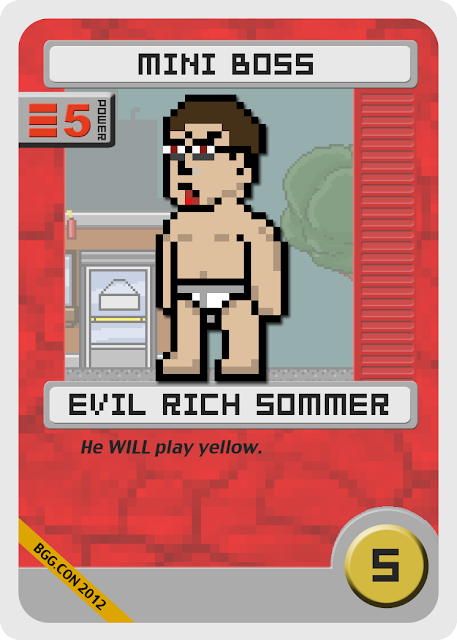 Make sure you stop by, try the game, and throw in the Evil Rich Sommer card for extra fun. Unfortunately I can’t be there this time, but I have a ton of conventions on the schedule. Metatopia is next week, and Unpub 3, LunaCon and Pax East are all coming up. 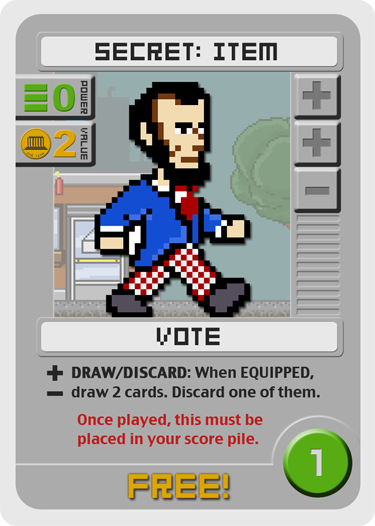 I always have an early copy of Pixel Lincoln on hand, so let me know if you would like to play. Here are a few examples of the custom cards.